This day must have felt like a roller coaster for the former President turned lawmaker. This morning, the Commission on Elections, voting 5-2 in an emergency closed-door en banc session, ruled in favor of filing electoral sabotage charges against her as well as Benjamin Abalos, Sr. (former COMELEC Chair) and Lintang Bedol (former Maguindanao election supervisor). The charges were later filed at the Pasay Regional Trial Court. The filing of charges and the issuance of an arrest order, accomplished in less than 9 hours, was obviously designed to render the Supreme Court order for the Aquino government to let GMA travel abroad to seek medical abroad moot and academic. As DZMM’s Dexter Ganibe reported, electoral sabotage is a non-bailable offense, but DOJ “will not object to a hospital arrest” for the leader. (GMANews.tv’s Amita Legaspi filed this report.) A Pasay City regional trial court on Friday afternoon issued arrest warrants against former President Gloria Arroyo and two others hours after the Commission on Elections filed an electoral sabotage case against them. A report on GMA News TV’s Quick Response Team (QRT), Pasay City Regional Trial Court Branch 112 under Judge Jesus Mupas, said that apart from Mrs. Arroyo, arrest warrants were also issued against former Maguindanao Gov. Andal Ampatuan Sr. and former Maguindanao election supervisor Lintang Bedol. Electoral sabotage, when evidence of guilt is strong, is a non-bailable offense. Promptly in a radio interview, the camp of Mrs. Arroyo likened to a “bullet train” the issuance of the arrest warrant against the former Philippine leader for poll fraud. Mrs. Arroyo’s legal spokesman Raul Lambino, said the issuance of the warrant was so soon and smacked of undue haste, radio dzBB’s Allan Gatus reported. At a press briefing in Malacañang, Justice Secretary Leila de Lima said they would not object if Mrs. Arroyo’s camp would ask for a hospital arrest. Aquino is now in Bali, Indonesia attending the 19th ASEAN Summit. “Hindi kami mago-object sa hospital arrest pero wala sa amin yan, ang desisyon does not lie with us, the complainant, nasa korte yan. Kailangan humingi sila, I think they should get court approval,” De Lima told reporters. She added that as long as Mrs. Arroyo stays in the hospital or at her home they would not arrest her. 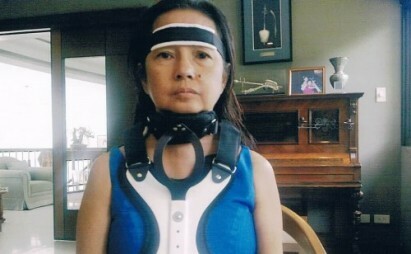 As of posting time, Mrs. Arroyo remains confined at the St. Luke’s Medical Center in Taguig City. The temporary restraining order shall be immediately executory. 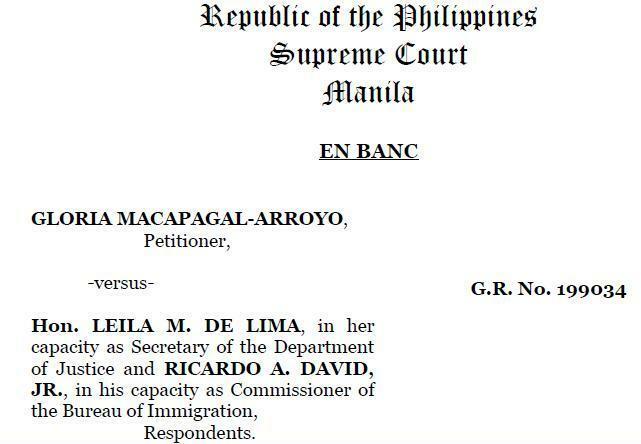 Justices Antonio T. Carpio and Bienvenido L. Reyes have reserved the right to submit their dissenting opinions. Leonardo-De Castro, J., on official business. Del Castillo, J., on official leave. (adv156 & 157). NOW, THEREFORE, effective immediately and continuing until further orders from this Court, You, Respondents, your agents, representatives, or persons acting in your place or stead, are hereby ENJOINED from enforcing or implementing DOJ Department Circular No. 41 and Watchlist Order Nos. ASM 11-237 dated August 9, 2011, 2011- 422 dated September 6, 2011 and 2011-573 dated October 27, 2011.